One piece molded white flipper & shaft assembly used on Bally & others. This is the white plastic flipper cap only for Gottlieb pinball. 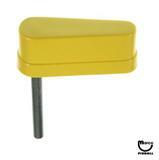 One-piece molded yellow flipper & shaft assembly with Williams logo and lightning bolt design. One piece molded transparent blue Flipper and Shaft assembly. © 2019 Marco Specialites - All Rights Reserved.